The Central Bank of Ireland has released it’s 2nd Macro Financial Review of 2014. Here are some highlights and quotes from the report. There have been pick ups in activity in both residential and commercial property markets. 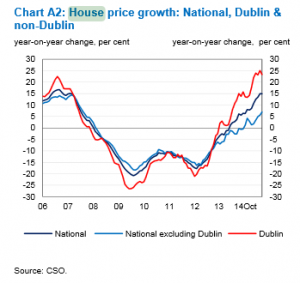 Low levels of housing supply are an important factor in the house price rises. Clearly the Central Bank is concerned about the rise in house prices as spelled out here. These developments raise a number of concerns from a financial stability perspective. The first is the rapid pace of house price increases over the past year or so. This could give rise to expectations of further increases and could lead to a misalignment of house prices. Secondly, rising house prices may prompt an increased demand for mortgage loans. It is important that appropriate credit standards apply to new loans. The Central Bank has recently proposed limits on the amount of new mortgage lending that can take place at higher loan-to-value and loan-to-income ratios. Their purpose is to ensure prudent lending standards are maintained throughout the credit cycle. Concern is not just limited to the housing market. The commercial market is also mentioned here. … activity in the commercial property market appears to reflect, to some extent, the search for yield by international investors. This leaves the market vulnerable to a change in investor sentiment and the availability of investment opportunities elsewhere. In general the review says Ireland is improving but still on very shaky ground and exposed to external shocks. high debt burdens in the private and public sectors and a large stock of non-performing bank loans. Beyond Ireland, there are geopolitical issues that could affect world output, deflationary pressures in some economies and the possibility of a reversal of the search for yield. Any of these could have negative consequences for the Irish financial system and macro-financial environment.